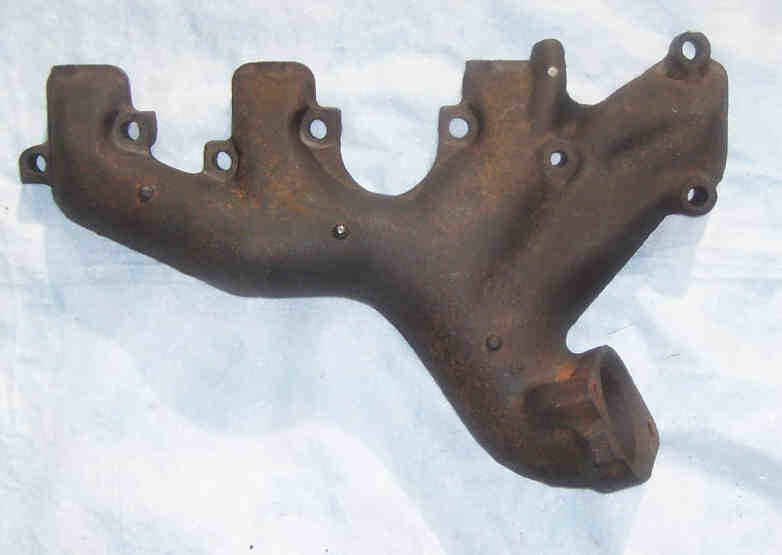 The exhaust manifolds used for most 428 Cobra Jet and Super Cobra Jet engines from 1968 through 1970 are easily identified by the cast engineering number if the manifolds aren't badly rusted. 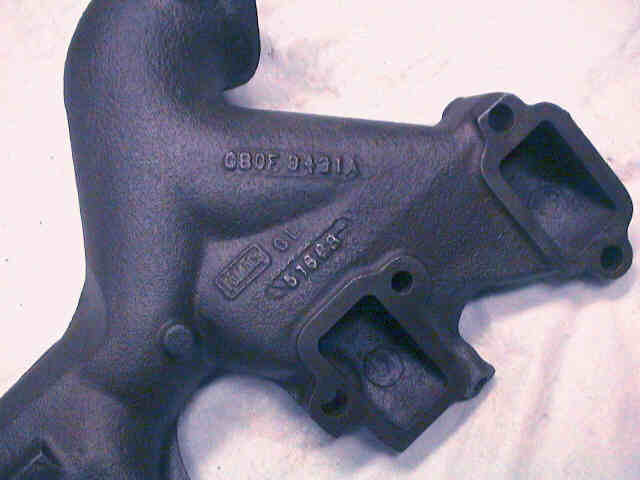 The manifolds are made from cast iron, and were originally installed without gaskets. These manifolds will generally not mount on non-Cobra Jet heads due to their unique mounting bolt holes. Ford documentation notes that the first 50 "135"-series Cobra Jet Mustangs used exhaust manifolds from Ford's 1968 390 engine. The lift hooks used with these manifolds were also standard 390-style lift hooks. 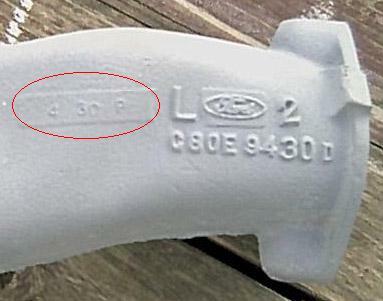 The exhaust H-pipes documented in Ford's 1975 Master Parts Catalog appear to confirm a change-over date of 1 December 1969 for the passenger side manifold. Prior to this date the manifold required a cast-iron spacer to mount the H-pipe. The manifold introduced after this date was modified to eliminate choke stove provisions and the need for a spacer. The most common 1968 - early 1970 manifolds with passenger side spacer are pictured below. 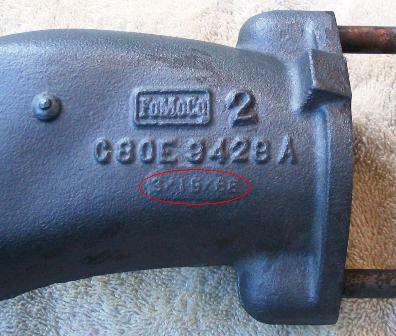 Here's a picture (courtesy of Bob Grosch) of the engineering number (C8OE 9428 A) and date code (3/15/68 circled in red) found on a passenger-side manifold. 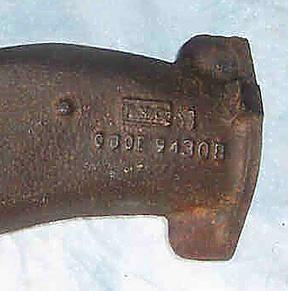 Note the uncommon 9428 casting number and the format of the date code (more on date codes below). Here's a picture (courtesy of Chris Teeling) of the engineering number (C8OE 9430 B) found on an early passenger-side manifold taken from a 1968 Mercury Cyclone. Interestingly, I can't find a cross-reference for this casting number in my 1970 Master Cross Reference List, but it obviously exists. Chris has also provided pictures of the C8OE-9431-A manifold and the engineering number detail found on the manifold. Note that this manifold does not have the reinforcing ridge that's found between the front-most exhaust ports of the later manifolds. Note their absence (locations circled in red) in this picture. 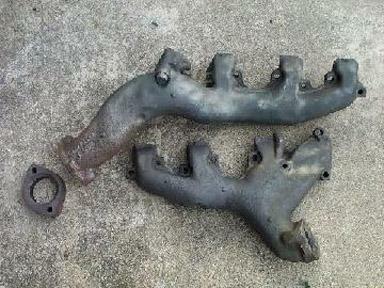 Here's a picture of a pair of mid-to-late 1970 exhaust manifolds; picture courtesy of Brian McDevitt of Ford Muscle Parts. Note the lack of provision for a choke stove noted in the red circle (all 1970 428 CJ carburetors used a manual choke). 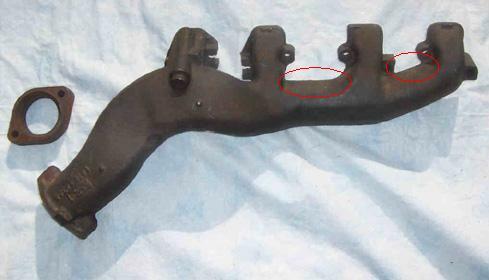 Note also that the passenger side manifold does NOT require a spacer as shown above; the manifold itself is chamfered for the metal donut used to seal the exhaust flange. Unfortunately engineering numbers are usually quite difficult to read precisely on anything but NOS or excellent used manifolds. 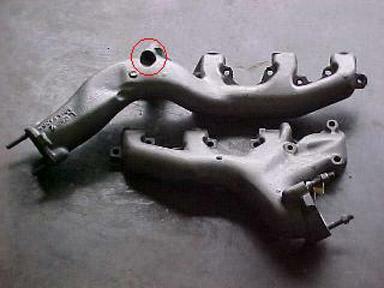 In the picture above you can barely see the passenger side manifold casting numbers just above the outlet port. 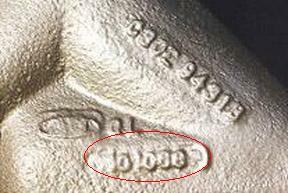 The driver side manifold casting number and casting date (pictured below) are found on the "engine" side of the manifold, making them virtually impossible to see when the manifold is installed on an engine. As mentioned above, these manifolds were originally installed without gaskets. During a rebuild it's important to ensure that the mating surfaces on both the cylinder heads and the exhaust manifolds are perfectly flat to avoid leaks. If you're not doing a concours-quality restoration using gaskets provides added leak protection; concours restorers can always use a small amount of high temperature RTV silicone sealer to help provide additional invisible insurance against exhaust leaks when gaskets aren't used. Here's a little known fact: if you've purchased a set of concours-correct exhaust manifold mounting bolts from AMK products you may have noticed that the kit includes both ramp-lock washers and a set of flat metal washers. According to Max Kotlowski of AMK, Bill Upham of Mansfield Restoration Parts, and Allen Cross these flat washers were used under the ramp-locks (between the ramp-locks and the manifold) to provide a solid mounting surface for the ramp-locks. This is counter to current info that I've seen published in many places, but all three have confirmed the use of the flat washers through a combination of Ford engineering drawings and observation of original cars.